Microscopic characterization of interfaces and surfaces has progressed significantly due to the simultaneous development of experimental probes and theoretical approaches. Experimentally, it is possible to resolve the atomic structure of internal interfaces and free surfaces using techniques such as HREM and STM, and these impressive studies have been the focus of several MRS books. At the same time, the advent of parallel computers and high-performance workstations has led to more sophisticated and realistic microscopic computer simulations of materials using both classical and quantum mechanical methods. 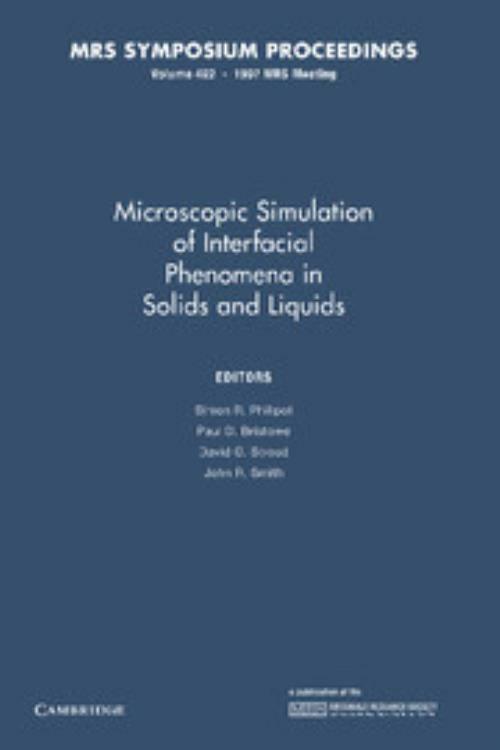 This book is the first to focus solely on the microscopic simulation of interfaces and brings together researchers interested in all classes of interfaces in both solids and liquids. and is organized around important interfacial properties: structure of fluid interfaces and surfaces; structure of solid interfaces and surfaces; chemical properties; dynamical processes; magnetic and dielectric properties; and elastic and mechanical properties. Simon R. Philllpot Argonne National Laboratory, Illinois. Paul D. Bristowe University of Cambridge. David G. Stroud Ohio State University.